ConceptDraw DIAGRAM is a business process mapping software for making EPC flowcharts to provide business process modelling. 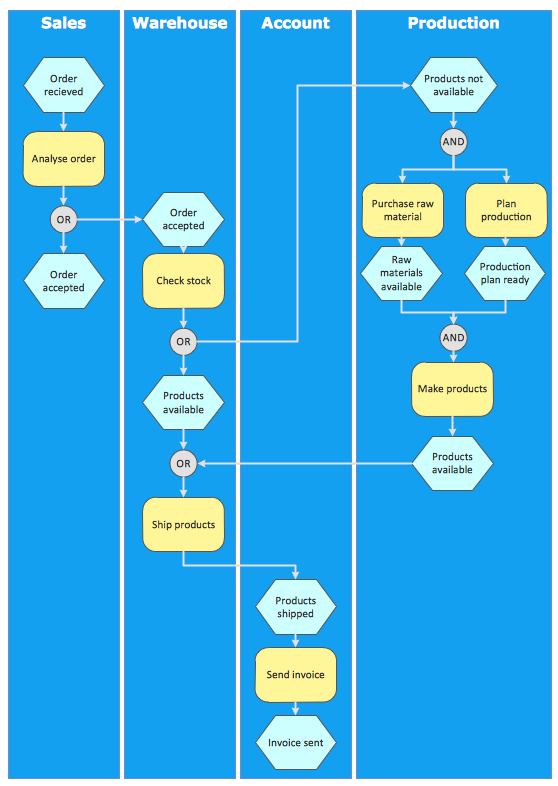 The Event-driven Process Chain (EPC) flowcharts allows managers visually present business process models for making decisions for business. The EPC is able to cope with extremely diverse and complex businesses processes. EPC flowchart as a result can represent the various elements in a way which is easy to understand. An EPC flowchart is a multifaceted method of analysing business processes. It makes sure that all the elements are indicated and business owners or managers are able to pinpoint duplication or inefficiencies of tasks and inputs. Just like any ARIS business process modelling method, EPC flowchart is an indispensible tool to help businesses analyse and improve their processes. Its excellent business process improvement tools. Stencil library EPC Diagram shapes, symbols from Event-driven Process Chain Diagrams solution provides 23 vector design elements for drawing event-driven process chain diagrams. Use design elements from the EPC Diagram Shapes library for drawing your EPC flowcharts to plan resources and improve business processes. The most worked out and commonly used methodology of business processes description is IDEF methodology. Besides business processes it allows to describe functional blocks, for example production and marketing. 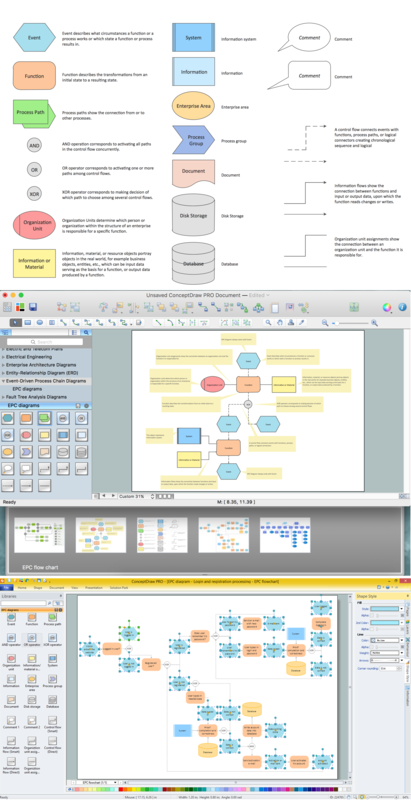 ConceptDraw lets creation of business processes description using IDEF0 and IDEF2 methods. ConceptDraw DIAGRAM v12 - business process modeling software for mac offers the Business Process Diagram Solution with powerful tools to help you easy represent the business processes and create the business process diagrams based on BPMN 1.2 and BPMN 2.0 standards that allows to create of both simple and complex (nested) models of processes. There are 16 BPMN 1.2 and BPMN 2.0 stencil libraries containing 230 vector objects: Rapid Draw library, Connections library, Gateways and Artifacts libraries, Data library, Gateways library, Choreographies library, Conversations library, Activities libraries, Events libraries, Expanded Objects libraries, Swim lanes libraries. ConceptDraw DIAGRAM v12 is a software for simplу depicting the business processes based on BPMN 2.0. Business Process Diagrams Cross-Functional-Flowcharts, Workflows, Process Charts, IDEF0 and IDEF2, Timeline, Calendars, Gantt Charts, Business Process Modeling, Audit and Opportunity Flowcharts and Mind Maps (presentations, meeting agendas). UML diagrams of business processes. The Rapid UML solution provides diagram examples, templates and vector stencils libraries for quick and easy drawing all types of UML 2.x and 1.x diagrams: UML activity diagrams, UML communication (collaboration) diagrams, UML component diagrams, UML composite structure diagrams, UML deployment diagrams, UML interaction overview diagrams, UML object diagrams, UML package diagrams, UML sequence diagrams, UML state machine diagrams, UML timing diagrams, UML use case diagrams.